IPv4 has been in use since the start of the Internet, and is widely deployed across the Internet, and home networks. In this tutorial we will cover the basics of IPv4 Addresses. An IP address has two components- A network component, and a node component. House Number + Street name e.g 12 King Street. 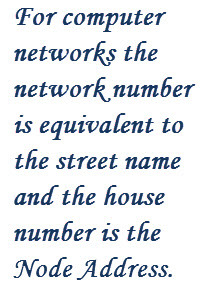 For computer networks the network number is equivalent to the street name and the house number is the Node Address. The earlier implementation of IPv4 used address classes to divide the address space into network and node components. This arrangement was very wasteful of IP addresses and was discontinued, but the terms Class A, B and C networks are still used. For Example Class A addresses would be used by large organisations (e.g. IBM) which had lots of computers (nodes) and so would require a large number of node addresses. Because there would only be a small number of large organisations then there would only be a small number of class A networks. Therefore there can only be 256 (28) Class A networks but each network can have 16,777,216 (224) nodes. Class C network addresses were for small organisations and used 3bytes for the Network and 1 byte for node addresses. We need a way of distinguishing a class A address from a Class B ,C,D or E address. The method used was to use the location on the first 0 bit in the the Most significant bits of the first byte. If the first bit is O then we have a class A Address. This type of addressing is known as classful addressing and resulted in very wasteful IP address allocation. It was replaced by a newer method called Classless Inter-Domain Routing (CIDR), .-See RFC 1518 and RFC 1519. The division between Network and node was accomplished using a technique called subnetting. All ones and All zeros node addresses – IP node addresses like 192.168.0.0 or 192.168.0.255 are not allowed. This means that a class C network like 192.168.1.0 has 8 bits for the node giving 28 or 256 possibilities. However due to the all 1s all 0’s rule then we can only have 254 possible nodes. 127.0.0.1 is commonly known as the loopback address, and is used for testing the local IP address stack. A packet addressed to 127.0.0.1 is not sent onto the network but only the IP software stack. Th entire 127.0.0.0 network is actually reserved, and so you could use any address in that range e.g. 127.0.0.3 would also work. The link local address range 169.254.0.0 is used to auto assign IP addresses when no DHCP server available. The most common form of addressing is unicast. In this form a message is sent to a single host using it’s IP address. A broadcast message is sent to all hosts on a network or subnetwork and is created by setting the the node part of the IP address to all 1’s. A sender sends a single message and all hosts on the network receive it. To send a broadcast to all hosts on the Class C network 195.1.1.0 you would send it to address 195.1.1.255. Note: Broadcasts messages do not go through routers. Because of the way networks work having a single network with thousands of hosts isn’t practical. It is equivalent to have a street with thousands of houses on it. Just imagine trying to get on to the street in the morning to go to work. Therefore a technique called subnetting was devised that allows you to split a network into smaller networks know as subnets. – Subnets and subnet Masking explained. IPv4 addresses use 32 bits are a written using dotted decimal notation. Address classes identify the network and node components of an IP address.